The two designs of exotic and other birds seen on this mug form part of an engraving seen in the Ladies Amusement and signed "R Hancock Sculp". This is consistent with the view that Robert Hancock supplied the copper plates used to decorate this Worcester mug. This print after Charles Fenn engraved by Robert Hancock is plate 68 in the second edition of Robert Sayer's The Ladies Amusement, published about 1762. The Worcester mug is clearly earlier than this but it seems most likely that Hancock was also responsible for the earlier prints on it. The other side of the mug has a second scene of exotic birds, also seen in the The Ladies Amusement, plate 68, shown above. The black printing of birds on this early Worcester mug is of a type known as "smoky primitive" due to its somewhat uncertain character. 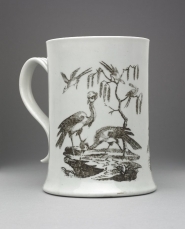 Printing of this class represents the earliest to be found on Worcester porcelain. It has been suggested that at least some of this class of printing may have been carried out in Birmingham, rather than at the Worcester factory. Some examples are enhanced with painting in colored enamels. These have a typical Worcester appearance in the palette and the painted borders employed. The mug itself is of a type called "scratch cross", as many pieces, like this example, are marked with an incised cross.